I’m a big fan of video marketing. I post daily videos and I create longer weekly content too. It’s one of the best and cost-effective ways to grow your network, build trust, and create some really powerful marketing. I recently hooked up with Matt Burke, AKA Matt the YouTuber. Matt’s been hanging out with us at the ranch for a few months now. He’s helping us and we’re helping him. I recently gave a presentation on video marketing and asked Matt to create a blog to accompany it. I posed the most common questions that I get asked about video and set him to work on the blog. Video marketing is the only way of ‘meeting’ someone before you see them in person, and the value in this is immense. Now, more than ever, you need to have an edge on your competition; something that makes you unique. You’re completely unique, so why not let people have an insight into who you are – and gain the advantage over the competition? Does my video need to be professional? What video do you engage most with? Someone being real with you on camera or a corporate video of a scripted piece of content trying to do nothing but sell to you? Throughout all filmmaking, you have to tell a story. The viewer needs to have a memorable experience and get to know who you are. This isn’t achieved by having the most professional video. To tell a story you have to be engaging with the camera. Show your passion about the topic you’re talking about and if you’re ever stuck for an idea, talk about something you are interested in! 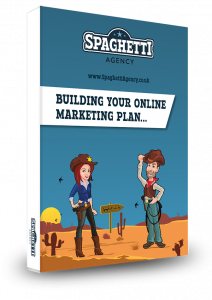 Without realising it, your interest will resonate with your audience. You have to be happy making the piece of content. To get to this point, approach it with an open mind and you have to remove your perception of what other people will think. Once you’ve done this your content will massively improve. Not caring has been the most crucial step in pushing the quality of my content to the next level. Once you’ve done this, you’re able to say and do exactly what you want and BE YOURSELF! Post whatever you feel like posting. “It’s better than the video you didn’t create” as Todd would say. Where should you upload your video? YouTube has long been the predominant platform to upload video on, but times are changing. Now all platforms are realising that people engage more with video then they do with simple text posts. 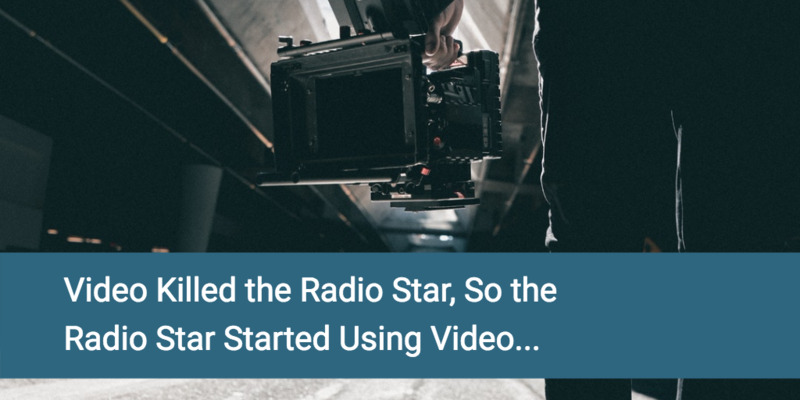 YouTube is great because it allows you to easily embed the link into blog posts, websites, and other social media posts – and still collate views from all of these. 300 million hours of YouTube are watched every day, so the potential is immense. I’ve embedded a vlog I made recently when I spent the day with Todd at Spaghetti Agency below. This lives on YouTube but can easily be embedded to a blog like this. It’s a simple way to share your video on other platforms. Think about where your audience are. 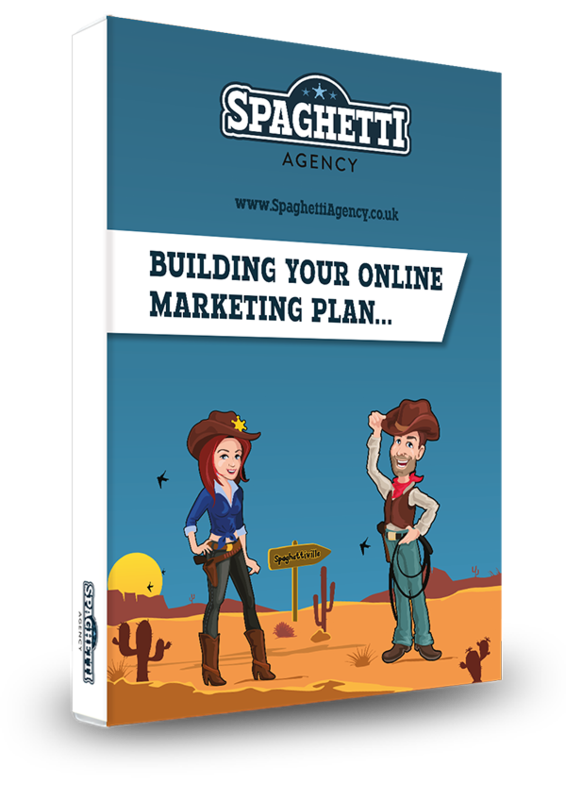 Spaghetti Agency has an active email list of people who read this blog, so hopefully they’ll be keen to watch the video, too. If your main following is on Twitter then post the link in a tweet and your YouTube channel still receives the views! Got fans on Instagram? Post 60 second videos on there instead. Big on LinkedIn? You’ll get up to 10 minutes of video time there, so share your video there by uploading the original video to a post (this is called native video) or share the link to the YouTube upload instead. Instagram and Twitter are now pushing video massively and recently we saw the introduction of shared livestreams on Instagram just like on Facebook. As on Facebook, when you invite someone to join your stream, all of their following (as well as yours) get notified! It’s a fantastic tool for organic growth and ties in nicely with the algorithm to push your ranking on the platform. 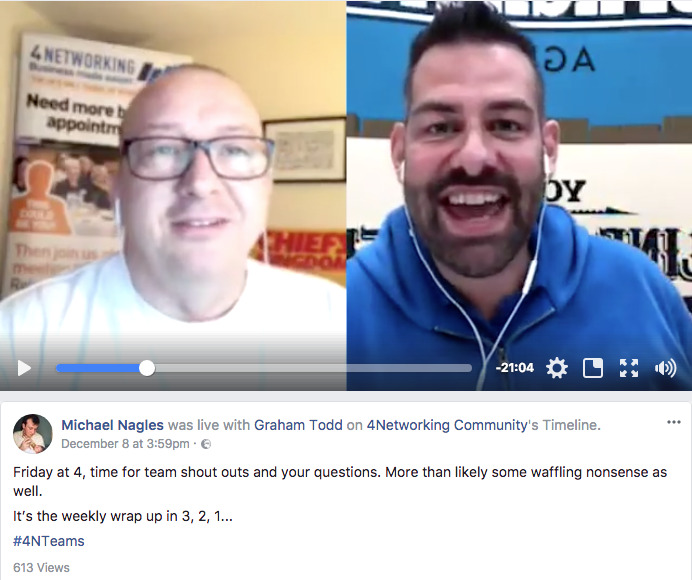 Here’s live weekly stream Todd does within the 4Networking network. (Todd joins the stream at 5minutes 30seconds). Live streaming like this also allows for interesting content and more importantly – collaboration – which has always been the most engaged content! Look at your network and see who you’d like to collaborate with. If it’s mutually beneficial then the answer will most likely be yes. If they say no? Send them this blog! Twitter have now integrated a view count on their videos, so what might seem like a small update actually has a massive influence. Ask yourself: Are you more likely to watch the video with one million views, or one thousand? Probably the larger number, right? By implementing this tool, if your video has gained a lot of views then it’s more likely to only further increase. Oh, and if you haven’t already, convert your social media accounts to business accounts as this allows you to track engagement, impressions, and have an in-depth overlook at each individual post. If you’re not sure how to do this just ask me. Every business has two key unique things: A story and the people running it. Start with that and you’ll have a never-ending stream of content. Behind every person in the business is a story with how they got there – that’s a series in itself. Here’s an idea for you: What mistakes have you made in business? How have you learnt from them? What can you help people learn? Videos like this do amazingly well because although mistakes happen, they’re key to learning and adapting. In making a video about a previous mistake your potential audience is huge. Most people don’t like making them though. So there’s a good chance you’ll stand out. Above all else you have to enjoy it. Just try and sit in front of a camera and make a video you have no interest in making – it’s difficult to make and hard to watch! If you’re struggling with getting in front of camera then take a look at this post I created for Spaghetti Agency which covers what gear you need, content ideas and what to do if you’re scared of video. As with anything in life, it’s about practice and Just Effing Doing It. You won’t be the first person to not like how they look and appear on camera, but the more you do, the less you’ll think about it. Your customers do more research into buying from you than you think. They look at all of your social media and try to form a picture of who you are. Make their life easy and post a video. When they watch a video of you talking to a camera they pick up on your mannerisms, the tone of your voice, your facial expressions, and more. This instantly forms a more powerful connection than a post on Facebook that’s you trying to sell your service. Stay true to your values, forget what people think, and go and create some unique content. What a great article, thank you. It’s very motivational and I’m actually smiling as I type this, imagining myself chating away to camera. But that is also one of the hardest things to do and I can always find an ‘excuse’ not to. Do you know what? I’ve posted video before that I thought were awful but something in them resonated with the viewers and they created some business and a lot of conversation and connections. Imagine what would have happened had I never posted it? No emails, no comments, no social media shares, no conversations, Nothing. The one you post is better than the one you don’t, and you never really know the true impact you’ll have if you don’t try and put it out there.